Size of Male: 55-80 lbs., 24-27 in. Size of Female: 45-70 lbs., 23-26 in. 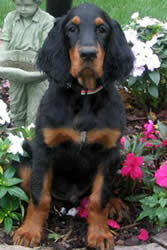 Deemed the heaviest, the slowest and yet the most sensible of the setter breeds, the Gordon Setter sports a coal-black coat with tan markings in the chest area and extremities. The pooch is what you could call a one-person dog. A jealous streak, a strong emotional attachment and an impressively long memory make this breed unforgettable. Seventeeth-century Scotland served as the cradle of the Gordon Setters, but it wasn’t until 100 years later that the world took notice of the pooches. They got their name in honor of one prominent dog owner: the Duke of Gordon himself! The hunters learned to love the black and tan canines, for although the dogs lacked speed, they had amazing stamina and strength to herd sheep and assist in hunting expeditions. Though rarely mentioned, there are 2 types of Gordon’s that emerged in the later years: those bred for dog shows and those who excelled in field trials. A small portion of these gun dogs function as modern-day pets. These able hunters are extremely sociable, loving and devoted to their human owner. Lavish them with affection, and they will return the favor several fold! As such, this dog breed tends to exhibit hostile and seemingly jealous behavior towards other pets. The dog requires a healthy deal of human interaction with the master of the house, but strangers will be met with wary suspicion and discrimination. Living Environment – A breed with energy levels and exercise needs this high fares best in a home that has ample leg room and yard space. Despite its zest for the outdoors, this dog’s need for socialization makes indoor living equally important. You may want to schedule the period that your pet will spend outside and inside of your house. Grooming – Heavy shedding makes the breed unfriendly for allergy sufferers. In terms of grooming, though, only a moderate commitment is necessary. By moderate, expect about 3 brushings a week and regular trimming in the bottom area. Check the ears for possible onset of infections, and make it a point to schedule clipping every few months. Diet & Exercise – One crucial point to remember is that the Gordon thrives on meals with high fat content and a healthy dose of carbohydrates (potatoes) and veggies to match. The protein source should preferably be poultry instead of beef. Strenuous physical exertion is a daily requirement. Puppies aged 18 months and below need extra care, however. Overexertion could trigger joint problems and elbow dysplasia. Each session lasts between 60 and 80 minutes on the average. Apart from leashed walks, the breed enjoys a myriad of challenges: swimming, ball games and off-leash play. Health – Elbow, eye and hip tests are strongly recommended. While the Gordon is popular for its strength and stamina, it is vulnerable to a number of health issues. Among the most common are gastric torsion, elbow dysplasia, canine heart disease and thyroid problems. In the dog training arena, crate training seems to work really well for this gun dog breed. The dogs are gifted with a sharp memory, intellect and eagerness to please. The trained Gordon Setter may manifest stubborn tendencies every now and then, but overall you will find the pooch relatively easy to handle.